This industry-recognized certification is held by over 1,000,000 IT professionals. Moreover, it’s vendor neutral, which means the skills you develop here won’t be tied to a specific company or technology; keeping your horizons in IT broad and deep. 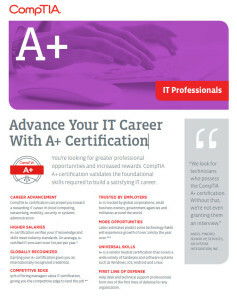 5 Reasons You Should Get CompTIA A+ Certified Today! You’ll Earn a Higher Salary: On average, A+-certified IT pros earn over $60,000 per year; this is according to the 2013 IT Skills and Salary Report by CompTIA authorized partner Global Knowledge. A+ is Globally Recognized: Earning your A+ certification gives you an internationally recognized credential. This means wherever your career takes you around the world, you’ll be able to boast holding a certification employers recognize. It Gives You a Competitive Edge: 91% of hiring managers value IT certification, giving you the competitive edge to land the job; this is according to the CompTIA Employer Perceptions of IT Training and Certification study. You’ll Get More Opportunities: Your future of fulfilling IT job opportunities starts with A+ certification; this is according to CompTIA’s 9th Annual Information Security Trends study. Labor estimates predict some technology fields will experience growth of over 20 percent by the year 2020. Your Skills Will be Universal: CompTIA A+ is a vendor neutral certification, which means that A+ certified professionals can proficiently work with an extensive variety of hardware. In order to receive the CompTIA A+ certification, you must pass two exams: the 900 series- 901 & 902.